Daniel Coats, America's top spymaster, informed Congress this week in an intelligence briefing that Iran's ballistic missile work continues unimpeded and could be used by the Islamic Republic to launch a nuclear weapon, according to unclassified testimony. "Iran is pursuing capabilities to meet its nuclear energy and technology goals and to give it the capability to build missile-deliverable nuclear weapons, if it chooses to do so" Coats wrote in his written testimony to the Senate intelligence committee. U.S. officials are unsure if Iran will build nuclear weapons, but it is likely this intention would dictate Tehran's future adherence to the nuclear deal, which the administration of former President Barack Obama framed in such a way as to leave out the issue of ballistic missiles. Iranian military leaders claim their missile work is unrelated to the nuclear agreement and permissible under it. The country's refusal to abandon this work has caused concern on Capitol Hill, as well as among U.S. national security insiders who view the work as related to Iran's aspirations for regional dominance. The U.S. intelligence community maintains that Iran—which has the largest inventory of ballistic missiles in the Middle East—likely would use this technology to launch a nuclear weapon. "We judge that Tehran would choose ballistic missiles as its preferred method of delivering nuclear weapons, if it builds them," according to Coats. "Iran's ballistic missiles are inherently capable of delivering WMD, and Tehran already has the largest inventory of ballistic missiles in the Middle East." "Tehran's desire to deter the United States might drive it to field an intercontinental ballistic missile (ICBM)," Coats wrote, referring to Iran's covert missile work. "Progress on Iran's space program could shorten a pathway to an ICBM because space launch vehicles use similar technologies." 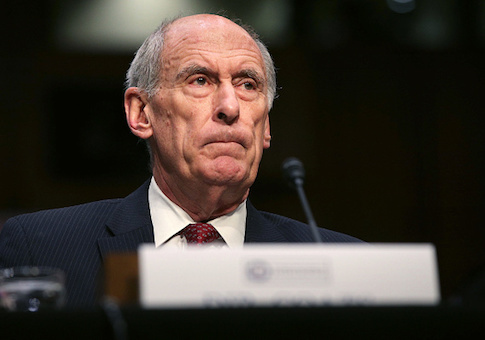 Iran "continues to leverage cyber espionage, propaganda, and attacks to support its security priorities, influence events and foreign perceptions, and counter threats—including against U.S. allies in the region," Coats testified. This includes cyber attacks "directly against the United States," such as in 2013, when an Iranian hacker penetrated the computer systems of a U.S. dam. Iran also is pursuing a massive buildup of its military, which observers have described as unprecedented. The U.S. intelligence community has confirmed that Iran is developing "a range of new military capabilities to monitor and target U.S. and allied military assets in the region, including armed UAVs [drones], ballistic missiles, advanced naval mines, unmanned explosive boats, submarines and advanced torpedoes, and anti-ship and land-attack cruise missiles," according to Coats.